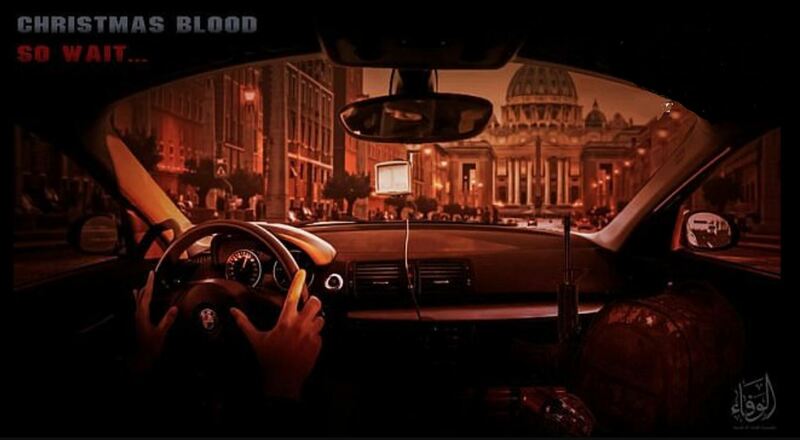 A poster by the pro-ISIS Wafa Media Foundation shows a terrorist driving towards St Peter's Basilica in Rome with a gun and a backpack inside his car. At the top of the poster is the message 'Christmas blood' with the line 'so wait...' written in red underneath. Christmas has become a time of heightened terrorist threats in the West. Last year, on December 15, an ISIS terrorist drove a truck into a Berlin festival market, killing 12 and injuring 56. In 2015 Rizwan Farook killed several colleagues at a Christmas party in San Bernardino, California. Security at Christmas markets across Europe has been bolstered this year and market staff in Britain have been given anti-terrorism training by police, teaching them what to look out for and what to do in the aftermath of an attack. CBN News has reported on the Islamic State's hope to conquer Rome and behead the Pope. "ISIS thinks that Rome is one of its primary goals and is in its timetable," Robert Spencer, author of The Complete Infidel's Guide to ISIS, said. Muslim fundamentalists dislike Christmas because Islam teaches that Jesus was not the Son of God.